This entry was posted in Brisbane, Family History, Fearless Females, McCorkindale Family History and tagged Annie Sim, Annie Sim McCorkindale, Backrow farmhouse, Bothkennar Stirling, Burns Club Canberra, Calendonian Pipe Band Brisbane, Duncan McCorkindale, Edith McCorkindale, Guildford St Kelvin Grove, Jean McCorkindale by cassmob. Bookmark the permalink. Ah! I loved reading about this feisty lady! How hard for her to leave beautiful Stirling – a place close to my heart as I attended Stirling University. I was wondering if you still have bagpipers in your family? You are fortunate to have the great photograph ..I wonder if the long chain might be attached to a watch or a pince nez? Thanks Angela…didn’t know about your Stirling connections. Sadly as far as I know there are no pipers in the family….too many daughters though I wish I could have learned. I think you’re right that there’s something useful on the chain like a watch or pince nez or key? You really do have the most interesting ancestors, especially the women. I loved reading this story. As for the dress, I would agree, the black collar looks slightly different and she has lost weight over the years, but I think the dress is the same. 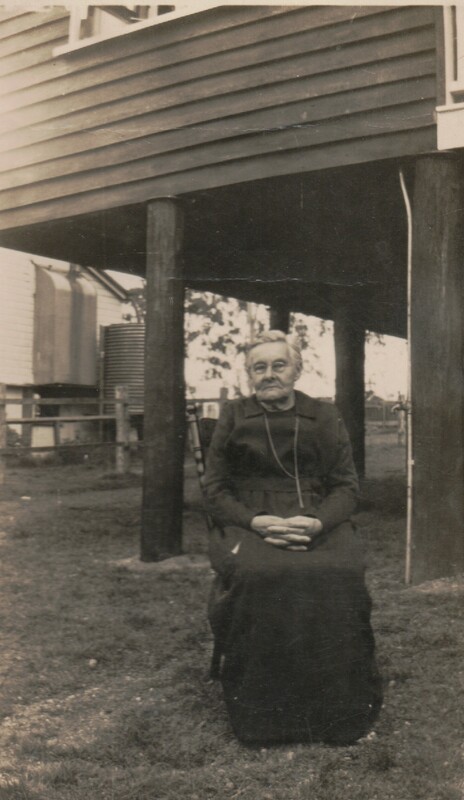 How I would love a photo of the rest of my great grandmothers.. I do have some of my maternal grandfather’s mother, and of a couple of generations back, but not for the rest of them. Treasures indeed. Thanks Chris. I think all of our ancestors are interesting when we find enough records to learn more about them. Unfortunately with women that’s not always easy. I have my final female ancestor profile ready for tomorrow. I’d love more photos of any of my ancestors really. I think I have one of mine but not 100% sure -have deduced it’s her for a variety of reasons. It’s great that you have good photos of one family at least. I enjoyed reading more about your grandmother and I agree, it’s the same dress. Thanks Kristin. I think they knew all about recycling in those days. Just stumbled upon this post. It seems my wife shares the same Gt Gt Grandparents as you. Her Gt Grandmother was Jane Sim (1847-1917) daughter of James Sim and Ann Wood. I can see a family likeness between them too. Send me an email if you’d like to know more. You wouldn’t happen to Have any photos of Jane at your end of the tree would you? Hi Alan, sorry, slowly catching up with comments. Sadly I have no photos of Jane but I will be in touch via email. 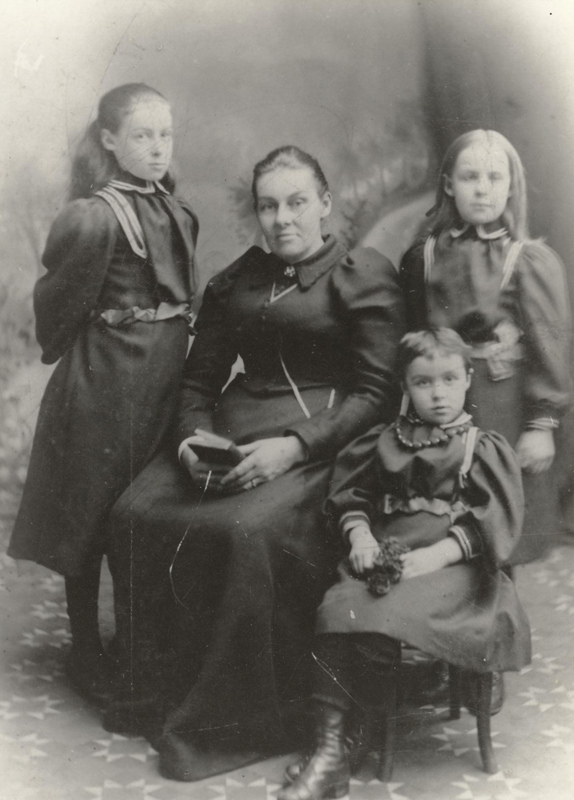 And I am a descendant of Agnes Sim (1849 – 1908) Agnes was the daughter between Jane and Annie. Wow! Thanks for getting in touch…an email coming your way tonight. Annie Sim McCorkindale was the sister of my Great Grandfather James Sim. Her daughter Isabella McCorkindale was witness at her cousin Annie’s wedding to my grandfather on the 4th Dec 1903 and Kirktin Bothkennar. Annie died leaving a large family of 7 children and my Grandmother, Annies sister Isabella, who was a widow with 3 children, helped bring up her family and later married Annie’s widowed husband. They then added my mother and aunt to their already large family. Interesting to add details of this Australian branch of the family. Great to hear from you Morag and I’ve learned something new too. I will email directly.